As we all know that the Christmas is round the corner and preparations have already been started for celebrating it. The best way to spread holiday cheer is by giving people what they demand for and the first thing people demand during festivals is Delicious Cuisines. Being a festive day, it of course will not be a complete one until sweets are served. Check out the delicious dessert recipes which can definitely help satisfy the Christmas Grinches of all the foodie guests this season and make them crave for more. OREO CHRISTMAS TREE: The best and the easiest Christmas treat to be served. White Chocolate Chips: 2 Cups. Green Food Coloring: 6 Drops. Melted Chocolate Chips: ¼ Cups. Combine coconut oil, chocolate chips and food coloring in a small bowl. Microwave in 30 second intervals, stir occasionally until chocolate is melted. Stir until smooth. With a parchment paper, line up a small baking sheet. Dip Oreos in Green Melted Chocolate to fully coat it. Once done, place it on a baking sheet and sprinkle sanding sugar and nonpareils. Freeze until chocolate gets hard for about 10 minutes. In a large triangle shape, arrange oreos, side by side to form a tree on a serving platter. Break a small piece of a pretzel rod and dab a bit of melted chocolate on the bottom middle Oreo to make a trunk. Pipe the chocolate to look like string for Christmas lights on the tree. Arrange M & M’s on top of the melted chocolates to look like lights. Set it for 5 Minutes and then Serve. To the long list of must have cake, never forget to include this. Sugar Cookie Dough: 1 Log. Preheat Oven to 350 degree and with parchment paper, line 2 large baking sheets. Scoop tablespoon sized rounds of cookie dough and roll in balls. Bake until cookies turn golden brown around the edges, approx. 10 to 15 minutes. Once done, let it cool. Frost each cookie and decorate with M & M’s and sprinkles. On top of each baked cookie, place a rolo. The easiest holiday and a must have dessert on the list. A treat which will always be remembered for long. Brown Mini M & M’s: 30. Red M & M’s: 15. From the center, cut down the pretzels in half. Dip edges of each pretzel half in marshmallow fluff and press onto the top of each Milano cookie. Dab some powdered sugar on top of the fluff to make sure it doesn’t stick. Flip the Milano cookies and place them on parchment baking sheet. In a piping bag, place frosting with a No. 3 sized round piping tip to draw 3 circles on each cookie- 2 for the eyes and 1 for the nose. In the center of each melted white chocolate circle, forming the reindeer’s eyes, press a mini M & M.
Final blob of icing on each cookie with a Red M & M, “M” side down. Something which is almost at the height of cuteness to eat. Devil’s Food Cake: 1 Box. Cream Cheese: Two, 8oz Packages. With liners, line up a muffin tin. According to package directions, make chocolate cupcakes and let it cool down. Beat the sugar, butter, cream cheese and vanilla until it gets light and fluffy in a bowl for making cream cheese frosting. Divide the frosting. Transfer 1/3rd in a small bowl and dye the rest of the frosting. On the cupcakes, in a conical shape to mimic Santa hat, pipe red frosting. To pipe the white frosting around the edges, use a smaller star tip. The dessert can increase anybody’s appetite with just its look. Cupcakes-lights around your house. Whipped Heavy Cream: 3 Cups. According to the package directions, make chocolate cupcakes. Let it cool down completely. Beat heavy cream until stiff peaks form in a bowl for making cream cheese frosting. Set aside. Take another bowl and beat cream cheese, vanilla, salt and sugar until light and fluffy. Fold in whipped cream. Transfer to piping or Ziploc bag. Frost cupcakes. Around the frosting with decorating gel, trace a black line. Stick M & M’s along the black line, imitating rainbow. Repeat to frost all the cupcakes. It’s a guarantee that it will melt your heart. Baked Sugar Cookies: 1 Dozen. Marshmallows, halved at an angle: 6. White Cookie Icing, For Decorating. Melted Chocolate or black cookie icing For Decorating. Orange Jimmies: 12 for Noses. Mini M & M’s: 24 for Buttons. To create melted blobs, spread white cookie icing on sugar cookies. With black cookie icing to make dots for eyes and smile, decorate marsh mallows. Insert for nose, an orange jimmy in the marsh mellows. Place a marsh mallow on cookie icing around the neck. Place mini M & M’s on cookie icing for buttons and add chocolate jimmies for arms to decorate buttons and arms. Decorating a Sugar Cookie Christmas Tree is much better than decorating a real tree. All Purpose Flour: 2 ¼ Cups. Water or Milk: 3 TBSP. Red and White Pearl Sprinkles: 3 TBSP. Preheat the oven to 350 degree and line two cookie sheets with parchment. Until light and fluffy, cream sugar and butter, approx. 3 to 4 minutes. Mix in vanilla, almond extracts and egg. In a separate bowl, whisk the dry ingredients. Add dry ingredients to wet ingredients and mix up until smooth. Make 3 sizes of cookie dough: 1 TSP., 2 TSP., 3 TSP. Place medium and large cookies on a cookie sheet and press down on each and bake for around 7-8 minutes. Place smallest balls of dough on another cookie sheet and press down slightly and bake for around 5-6 minutes. When cookies are done, let it cool. Beat butter until smooth. Add half powdered sugar and mix it up. Add green gel icing color to frosting and mix to make the frosting. Take one cookie of each size , fit a piping bag with a medium sized star piping tip and fill the bag with green frosting. To assemble the cookies. Pipe a swirl of frosting on the largest cookie, then add the second medium sized cookie on top. Pipe a swirl of frosting on the second cookie, top it with the smallest cookie. On top of the final cookie, pipe a swirl and decorate. 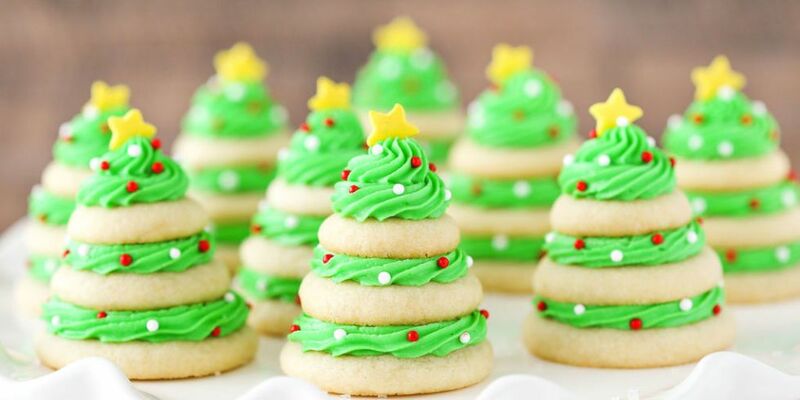 Continue building cookie trees and refrigerate until ready to serve. 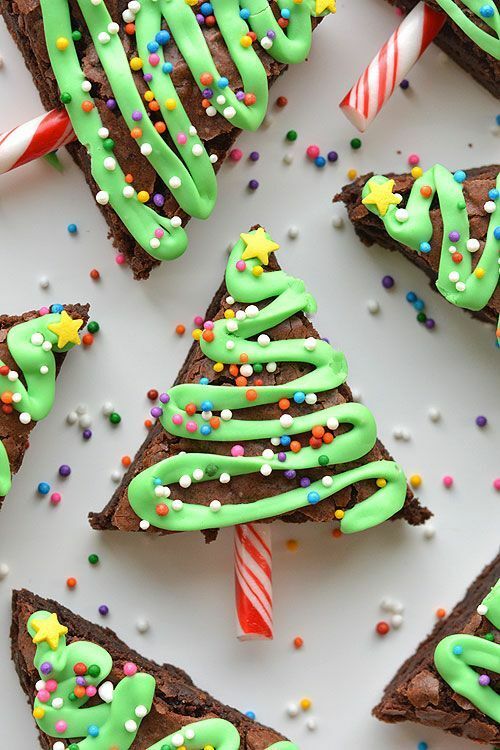 If a batch of boxed brownies can be made, these brownie trees can be made too. White Vanilla Icing: 1 Tub. Line up an 8” * 8” baking pan with aluminum foil and spray with a cooking spray. According to the package directions, prepare and bake the brownie mix. Let brownies cool for around 1.5 hours. Once done, remove the brownies and cut into triangles. Unwrap the candy canes and use a sharp knife to break the candy canes into 1.5” long pieces. Press the sharp end of the candy cane into the bottom of the brownie triangles. Spoon out approx ½ tub of icing into a bowl. Spoon the green icing in a zip lock bag, seal it and cut off a small corner with sharp scissors. Starting at the top of the brownie triangles, gently squeeze out the icing in a curved zigzag as you go down. A perfect non bake mischief munch to give your guests a feel of mischief. Total Time: 1 Day 11 Hours. French Toast Crunch Cereal: 2 Cups. Cookie Crisp Cereal: 1 Cup. Life Cereal: 2 2/3 Cups. Red and Green M & M’s: ½ Cup. Mini Chocolate Chips: ¼ Cup. Combine all cereals, mini marshmallows and M & M’s in a large bowl. In a microwave safe bowl, melt white chocolate in 30 second intervals, stirring in between. Pour over cereal mixture and stir to coat everything. Transfer the mixture to a baking sheet, top with holiday sprinkles and mini chocolate chips and refrigerate until firm. Serve your guests this piece of desserts and watch them get excited with the taste. Pound Cake Mix: 2 Boxes. Red & Green Food Gel Color. As per instructions on the box, mix the pound cake. Add a few drops of red food coloring at a time until you get the red food color. Once the cake is baked , let it cool and then cut the cake into slices. Then, use a heart shaped cookie cutter to cut out as many hearts as it takes to lay them down face to face from one end of the pan to the other end. Make sure it fits properly leaving some space at each end for the green cake mix. Mix the 2nd cake and add green food coloring. Pour the green batter around the heart cutouts. Tap the pan on the counter so that the batter falls down the sides of the hearts. Bake it according to package directions. Frost the cake with green frosting and add heart sprinkles. So Peeps, enjoy these wonderful desserts this Christmas and make this year a memorable one. Also, do not forget to share the desserts with your loved ones. Show your cooking and baking skills and fulfill the needs of foodie relatives with these unique desserts because Christmas is never complete without some tasty, delicious and lip-smacking desserts.